The national soccer team-Harambee Stars-will take part in two international friendly matches in Marrakech ,Morocco in March against Comoros Island and Central African Republic. 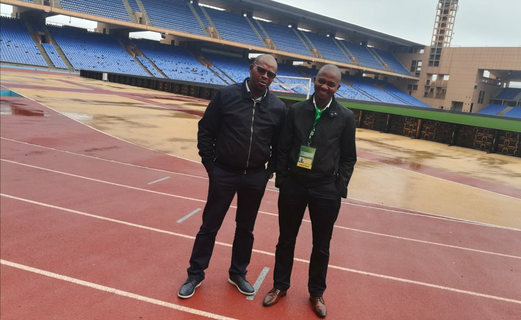 FKF President Nick Mwendwa and CEO Robert Muthomi toured the venue in Marrakech, Morocco to ensure all was set and sort out other logistic issues before Harambee Stars arrive.The duo are also attending a Women's Football Symposium at Morocco. "This Afternoon we visited the stadium in Marrakech where Kenya will play two friendly international matches on 24th and 27th march 2018," FKF CEO Tweeted. The first match will be against Comoros on March 24th then on 27th March Kenya takes on Gambia. Both dates are part of FIFA recognized friendly match days and the results will count in FIFA ranking where Kenya is currently at position 106th Worldwide. Muthomi had told FKF website: “We are happy to have secured the two friendlies as part of our build-up matches ahead of our 2019 AFCON qualifiers against Ghana. FKF is working hard to find a replacement for ex-Harambee Stars coach Paul Put who left for Guinea. “We feel that the matches will not only provide the technical bench with the much-needed opportunity to assess the players but that it will also keep the national team active during the upcoming FIFA international week, key in preparing for future assignments,” added Muthomi. The matches will be part of preparations for the 2019 Africa Cup of Nations Qualifiers. Kenya hosts Ghana on 7th September in a Group F tie in Nairobi, a match they must win to harbor any hopes of participating in the bi-annual tournament.